My hair is fairly thick, so I always deal with a lot of my hair falling out. I am constantly picking it off of my clothes, off my laptop, and off of everything else. Now that the weather is changing again, I'm starting to lose even more hair. Although I have hair to spare, I'm taking steps to reduce breakage and shedding caused by weak hair. By strengthening my hair, it doesn't fall out as much, and it looks healthier. Since I do get my hair professionally colored with three colors—brown, red, and blonde—and straighten it often, I need to take really good care of my hair to prevent future breakage and strengthen hair. 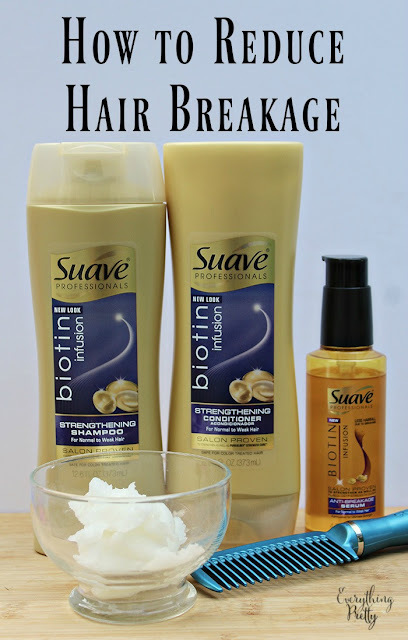 I've been a big fan of Suave for many years, and I recently tried the Suave Professionals Biotin Infusion from their new 2016 collection. Many of Suave's collections are salon proven to work as well as luxury brands at a fraction of the price! Since I can get them at Walmart, I can get them on my weekly shopping trip without making a trip to a specialty store. I tried the Biotin Infusion because my hair has been breaking lately. This collection is infused with vitamin B7, otherwise known as Biotin. Biotin is known to strengthen hair, and this collection can reduce breakage by 95 percent for less hair loss versus using other products. In fact, the Biotin Infusion Strengthening Shampoo and Biotin Infusion Strengthening Conditioner been proven to strengthen your hair as well as Pureology® Strength Cure®! The Biotin Infusion Anti Breakage Serum makes hair 20 times stronger than using a non-conditioning shampoo. I rub it between my hands to get the oil all over and then gently work it through my hair so my hair doesn't get oily. This serum has made a big difference in my hair, so I'm definitely keeping this in my how to stop hair breakage routine. Never, ever brush wet hair. Wet hair is more prone to breakage, and the brush can really damage your hair, especially if your hair breaks a lot. Instead, wait for your hair to dry. You should also consider using a wide tooth comb to use instead of a brush. Be gentle on your hair by washing it every other day or every third day. This reduces a lot of stress on your hair for less breakage. If you have brittle hair, don't skip the conditioning step. It helps add moisture and strength to your hair. Heat appliance can damage your hair and make it weak. Try to let your hair air dry and avoid using a flat iron if possible. If you have to use a heat appliance, be sure to use a heat protectant first. Once your hair splits, it will keep splitting and get weaker. Keep your hair healthier by getting it trimmed regularly to remove split ends. To keep your hair healthy and strong, use a hair mask once a week. I like to use coconut oil because it's inexpensive and works well. Just massage all over your hair and scalp and let sit for several hours before washing your hair. If your hair gets tangled while you sleep, try sleeping on a satin pillowcase. You'll wake up with fewer tangles, which means less damage to your hair during your daily brushing. Visit your local Walmart to try out all of the new 2016 Suave Professionals collections: Coconut Oil Infusion, Coconut Milk Infusion and Biotin Infusion, while supplies last.